i'm closing up work here, getting ready to walk around my neighborhood to get out the vote for obama. i could put link upon link in this post, tell you how effective his website is, show you numerous designs & well made prints for obama, or quote some beautiful thing that he has said or that people have said about him - but what i really want you to do is vote. make your plan tonight if you haven't already voted; get past the kaos, find your polling center, talk to your boss about getting in late or leaving early - no excuses people! i'll be hitting up the war room obama election party tomorrow on capitol hill. the idea of surrounding myself with shepard fairey murals, eating at the skillet & consuming mass quantities of molly moon makes it hard to resist. the above poster based on the joan baez anti-war poster & designed by some women in brooklyn is getting a little bit of hassle. thanks for finding & sharing t.
I love the fact that the poster is getting so much hassle and hype. That's a good thing in terms of political effectiveness. At any rate, let's hope we can toast to our new president this evening. 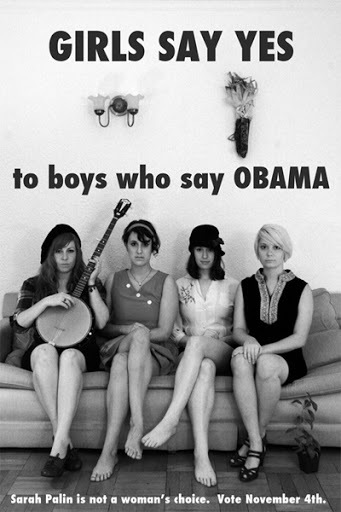 Say yes to Obama.